Now isn’t that pretty? 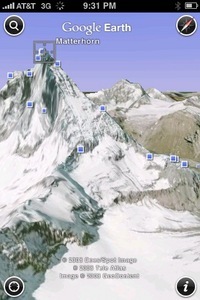 It’s how New York looks in Google Earth. Every building on Manhattan Island has now been meticulously mapped out and covered with photographic textures. It joins LA, San Francisco, and Berlin. When’s London due, eh? Want to fly around the Big Apple yourself? 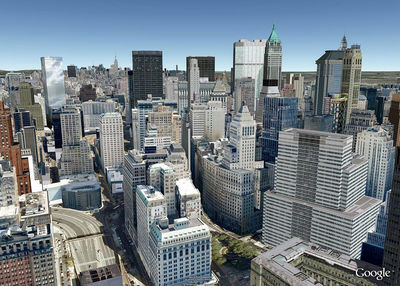 Simply download Google Earth, fly to New York City, and turn on the 3D buildings layer. Then give it a minute to download the data, and Bob’s your uncle. You’ll need to buy him a Christmas present. Click over the jump for a ‘before’ picture of how the city looked in January last year. This beautiful cloud represents the entirety of music. Every single artist tracked by Last.fm is marked as a point on the map, and ‘similar’ artists are connected by a grey line. 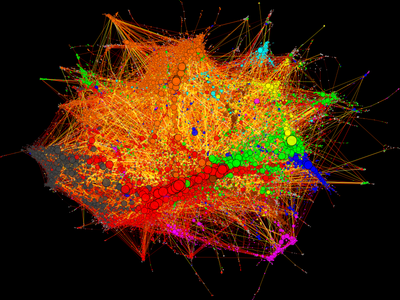 The size of each point reflects the popularity of the artist, and different colours represent different genres. It’s the creation of Budapest University PhD candidate Nepusz Tamas, who hammered Last.FM’s servers for over a week with a request every five seconds. Unfortunately, the only way to interact with the map is to pinpoint your favourite bands, and you can’t zoom in, but it’s still a beautiful representation of the world’s listening habits. Guess what The Potato Genome Sequencing Consortium is up to these days? It is sequencing the DNA of a potato. 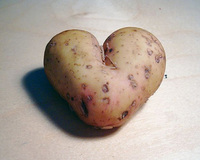 The Potato Genome Sequencing Consortium, who we would very much like to work for, reckons it will have the white potato perfectly sequenced by 2010, which will help with things like making them grow in the apocalyptic desert wastelands of the future.